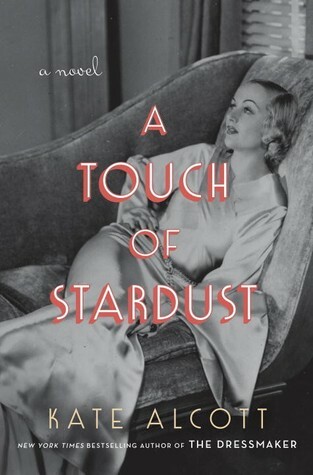 A Touch of Stardust By Kate Alcott. Kate Alcott writes spectacularly strong feminist female characters in historical fiction. Women who want to have careers and love. Women who juggle and manage both. Or learn from their decisions. They’re smart protagonists and Alcott has quickly become a must-read favorite author for me. She intermingles her fictional characters in real-life historical settings and it works. Last year Alcott’s The Daring Ladies of Lowell – a superb story about the Lowell mill girls based on actual events–made my 12 Best Fiction Books of 2014 list. A Touch of Stardust finds Midwesterner Julie Crawford on the set of Gone with the Wind. It’s 1938 and the young woman dreams of being a screenwriter like Frances Marion who wrote scripts for the legendary Mary Pickwick. Crawford works in the publicity office of producer David O. Selznick like her rooming house mate Rose, who dreams of being an actress like many young women who venture to Los Angeles. Plucky, determined Julie Crawford bumps into Lombard on set and the Smith College graduate impresses Lombard who asks her to work as her personal assistant. Crawford soon becomes part of Lombard and Gable’s rather glamorous lifestyle. Through a few introductions, she works her way to screenwriting. Lombard becomes a dear friend, confidant, older sister and advisor. By year’s end she’s rewriting scripts and quite content in her new profession and new city. In the meantime she becomes involved with an older associate producer, Andy Weinstein. They start slow but soon fall for each other. Complications arise due to the age difference, his being Jewish and their varied careers. As WWII intensifies Weinstein, who has family in Germany and France, feels compelled to enlist in the American Red Cross. Until then he’s working diligently on Gone with the Wind and supports his new girlfriend’s screenwriting endeavors. Kate Alcott’s father-in-law Herman Mankiewicz won an Oscar for Best Original Screenplay with Orson Welles for Citizen Kane. He also wrote Cleopatra and All About Eve. This is one area in which she has some insider insight. And it’s fantastic. FTC Disclosure: I received this book for review from Doubleday.